Despite progress, many challenges remain before 2015 elections Kofi Annan concludes a two-day visit to Côte d’Ivoire, stressing that reconciliation and justice are intertwined. Conférence de presse à Abidjan le jeudi 10 Octobre Deux ans après une première visite des Elders, Kofi Annan retourne à Abidjan pour évaluer les progrès sur la voie de la réconciliation et les défis qui restent à relever. Press conference in Abidjan on Thursday 10 October Elders Chair Kofi Annan returns to Côte d’Ivoire to gauge the country’s progress towards reconciliation and the remaining challenges it faces. Press conference in Yangon on Thursday 26 September Jimmy Carter leads the Elders’ first delegation to Myanmar to support the country’s democratic transition and encourage peace and reconciliation. This week Jimmy Carter, Martti Ahtisaari and Gro Harlem Brundtland will travel to Myanmar – The Elders' first visit to the country as a group. Find out more about who they plan to meet and what they hope to achieve. "Israel's leadership, back then, understood that occupation cannot and should not persist"
"I tried to persuade Rabin to negotiate a permanent settlement"
What is the Palestinian strategy of 'Internationalisation', and what is it intended to achieve? Has it been successful? And how is it perceived by Israel? After visiting Democratic Republic of Congo, Rwanda and Uganda last week, Mary Robinson and fellow international envoys have issued a joint statement condemning recent violence and calling on armed groups to work towards a political solution. What is the Arab Peace Initiative – and how could it benefit Israel? 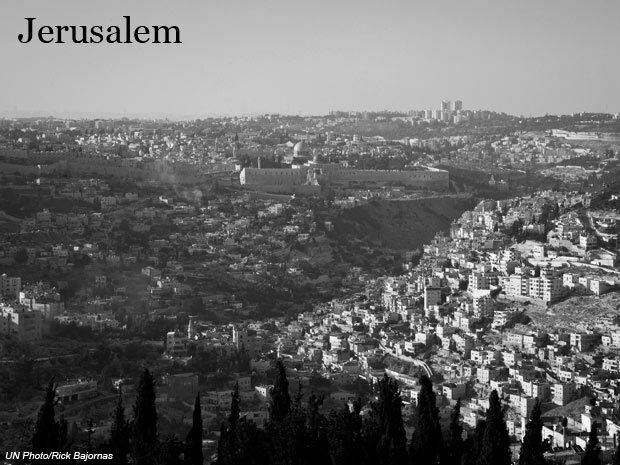 How could it play a part in the current bilateral negotiations between Israelis and Palestinians? And what do Israelis and Palestinians think about it? 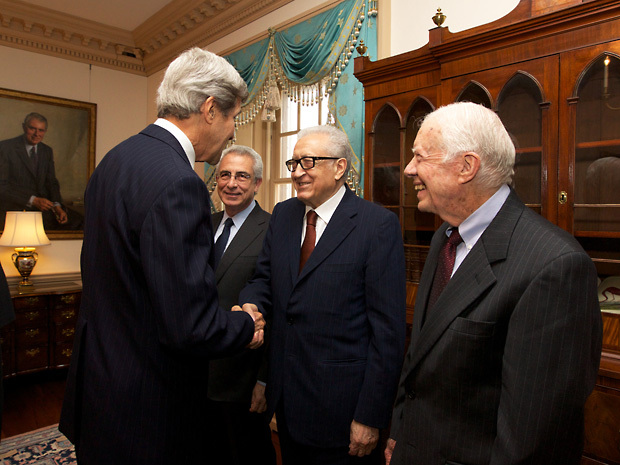 What was the Oslo agreement? How was it supposed to bring about a peaceful resolution to the Israeli-Palestinian conflict? And twenty years later, why has the peace process failed to move forward? Egypt: waiting for a Superman! 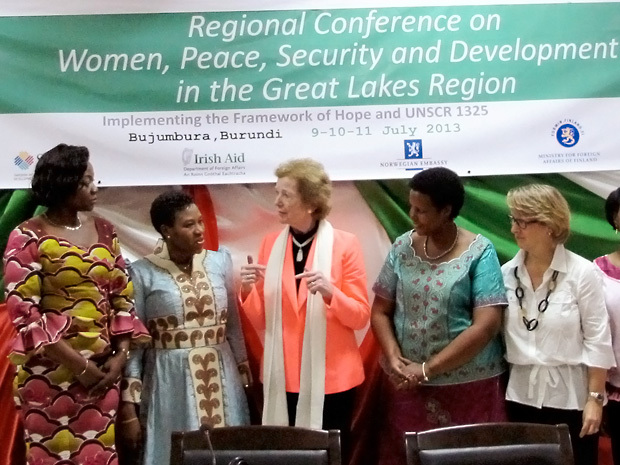 Politically Speaking, the United Nations Department of Political Affairs’ news bulletin, explores Mary Robinson’s work in the African Great Lakes region, explaining how the “Framework of Hope” can bring peace to the DRC and surrounding countries. "Violence is not the answer" – Kofi Annan After the recent violence in Egypt, the Elders urge the Egyptian authorities to prevent further bloodshed, and call on all Egyptians to work towards reconciliation. Sans les femmes, pas de paix dans les Grands Lacs! Last week, Middle East expert Rosemary Hollis chaired an Elders debate in London on the Israeli-Palestinian conflict. Writing in The Conversation, she gives a breakdown of the highlights from the event. Two members of The Elders are joining 'The B Team', a new non-profit initiative launched today that will work to deliver a new way of doing business: one that prioritises people and planet alongside profit. Kofi Annan writes to African heads of state to express The Elders’ support for peace efforts in the Democratic Republic of Congo, encouraging leaders to work closely with UN Special Envoy Mary Robinson. In Dublin this week for their twice-yearly meeting, the Elders are taking the opportunity to hear from young leaders about their work promoting peace, human rights and inclusion in Northern Ireland. Syria crisis: "We are not able to keep up"
"There is no sustainable future without the participation of our generation." Nigerian activist Esther Agbarakwe calls on governments to involve young people in debating the new global development goals agenda. 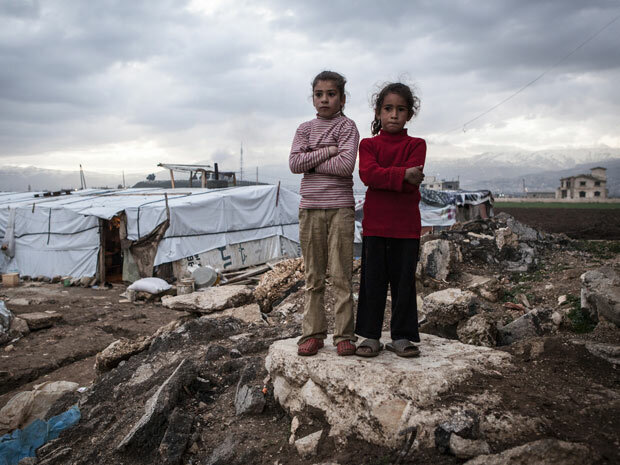 "Weapons, not blankets, are pouring into the country" As Syria's humanitarian crisis escalates, Desmond Tutu makes an impassioned call to the international community to put the safety of Syrians above politics. "Mary faces the formidable challenge of helping to bring about peace in a region torn apart by decades of strife." Desmond Tutu The Elders welcome Mary Robinson's new appointment and stand ready to support her in her mission. How can policy-makers help protect women and girls from violence? The Elders congratulate the new South Korean President Park Geun-hye on taking office and express their support for her commitment to constructive engagement with North Korea.